i mentioned fully embracing minimalism this year. which i don't think i've totally done in the past. i've always had minimal stuff, but not to the level i want. have you ever seen the show tiny house nation? i'm freaking obsessed. basically they take people who are just about to move into a tiny house (anywhere from 100 to 500 ish square feet, i believe) from a regular house. they help build the tiny house, making the most of the space, and the host prepares the homeowners for life in a tiny house. one of the things he does is outline the area of the house with some string and shows the owners just how little actual fits in there and how much they need to downsize still and really think about how much they'll be able to fit in the new house. my goal is to have so little it would fit in that little box, even though i'll never live in a tiny house. i just don't like stuff. and that led to a (mental) listing of every rule i keep in place to ensure that my stuff never grows like crazy. 1. one in, one out. before you totally declutter it'll be more like one in, 10 out. but as i get closer to exactly what i want, it's the one in, one out rule. nothing new comes in without something else leaving in it's place. if i get new jeans, the old ones have to go. if someone gifts me a new lipstick, an old one has to get thrown out. it's the best way for me to keep my possessions under control. it's particularly applicable to clothes and makeup, since those categories tend to grow without much thought. and more important, i ask myself if i can live without it. i don't automatically replace anything that breaks or gets worn out - i decide first if i actually need it. if i can live without it, it doesn't need to be replaced. 2. things can be (easily) replaced. i do not need to keep backups because i live in a big city. i can replace anything i need to within 15 minutes. probably even at 3 am thanks to 24 hour walmart. there's nothing i need to stockpile or keep extras of 'just in case' a product runs out or a sweater rips. some people find comfort in keeping those backups, but i don't. i don't want to waste the storage space on things i probably won't even remember i have. like toothpaste or lightbulbs - by the time i remember i have a backup somewhere, i'll have already bought a new replacement. this is also the $20/20 rule - if you can replace it for less than $20 in 20 minutes, you don't need to keep it around taking up valuable physical and mental space. 3. don't buy storage containers. at least, for me. i have absolutely everything i need. if i ever get the itch that i need a storage container for something, it's probably a good sign that i have too much and i need to declutter. i have a few containers i love (a nice one with a red top from container store for christmas stuff, my acrylic makeup organizer, etc.) and if the collection grows outside those boundaries, it's time to rein it in. 4. never impulse shop. i do not shop without a list. if i see something i like, i make a note on my phone, or put it in my online cart. if i still want it days or weeks later, i'll consider it. but i never stray from the list and i never buy something on a whim. 5. clutter attracts clutter, so keep the counters clear. do not even tell me this doesn't happen in your house. you put your junk mail down on the counter for one minute, and suddenly there's your purse, your husband's keys and wallet, a dirty coffee mug, your kid's mittens - clutter attracts clutter. it's physics, or something. i try to keep everything off the counters, which means having a space for everything that usually ends up there. it's particularly key in the kitchen. i try to leave out only the coffee maker, which i use every day, twice a day, so i'm not putting it in the cabinet. but i do put away the things that aren't used every day, like the toaster, cooking utensils, dish soap and the sponge, the crockpot. into the cabinets they go. everyone has different ideas of what minimalism is (clearly i defined mine with my tiny house nation comparison!) and there's no right or wrong version. i'm a fan of doing what's right for you, even if that means having all your things about you just so, like my dad. 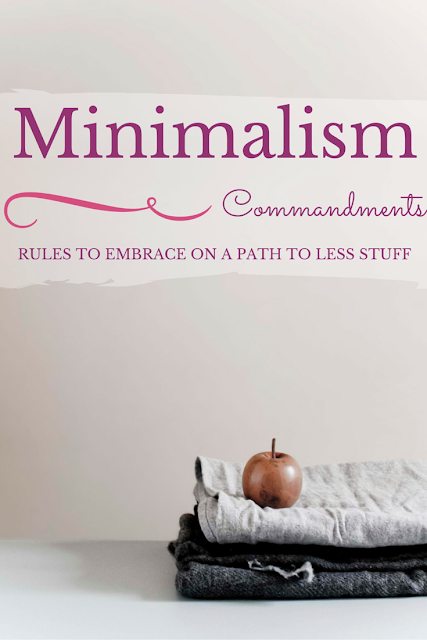 but for me, minimalism is the way to go and those rules in particularly really keep things in check for me. anything you would add to my list? what helps you keep clutter under control?